Farmer sentiment towards the ag economy holds steady for November but there is still concern over interest rates, the farm bill, and future profitability. Jim Mintert breaks down the November Ag Economy Barometer results at purdue.ag/barometervideo. 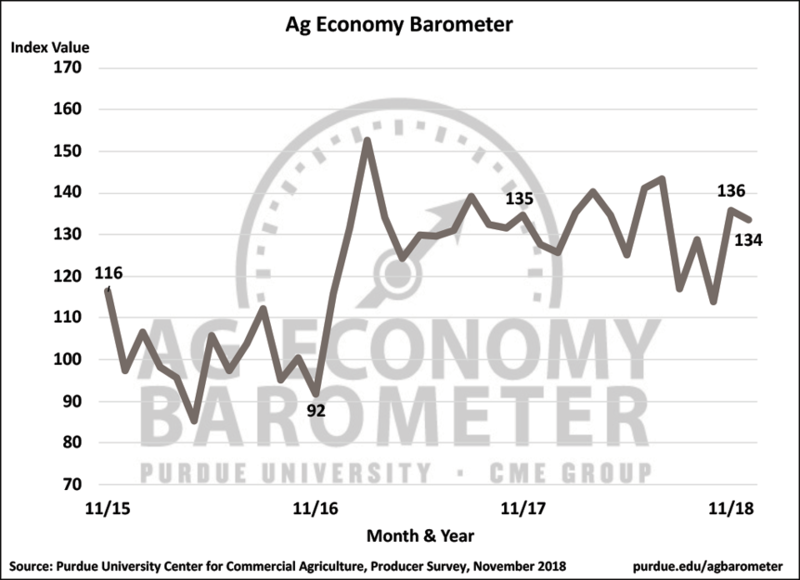 The Purdue University/CME Group Ag Economy Barometer November reading was 134, a decline of just over 1 percent from a month earlier when the barometer stood at 136. The November reading leaves the barometer 6 percent below its most recent peak, which was reached back in June before the impact of trade disruptions were felt throughout much of U.S. agriculture. Although November’s ag sentiment index was below the level attained last spring, it was still 6 points higher than a year earlier when the index of agricultural producer sentiment was 128. Figure 1. Purdue/CME Group Ag Economy Barometer, October 2015-November 2018. The modest decline in this month’s barometer reading occurred because producers view of future conditions weakened slightly as the Index of Future Expectations was 143 compared to 146 in October. Even with this month’s modest decline, the Future Expectations Index remains well above its September reading and very near its spring peak, indicating producers still have a relatively optimistic view of the future. The Index of Current Conditions at 115 was unchanged compared to October. Unlike the Future Expectations Index, the November reading of the Current Conditions Index was still well below its late spring peak, when the index topped out at 138. Figure 2. Indices of Current Conditions and Future Expectations, October 2015-November 2018. One gauge of producers’ optimism is their willingness to make large investments in their farm operation. Each month we ask producers if now is a good time or bad time to make large investments in items such as buildings and machinery. Producers’ perspective on making large investments has ebbed and flowed this year. Producers were most favorably inclined towards making large investments early in the year when the Large Farm Investment Index peaked at a reading of 74. The index weakened in late winter and early spring before rebounding in late spring, just before trade disruptions hit the agricultural sector. By late summer the index was more than 30 points below its January peak, bottoming out at a reading of 42 in September. However, since September producers’ view regarding the advisability of making large investments has improved, rebounding to a reading of 52 in October and improving again to 56 in November. Figure 3. 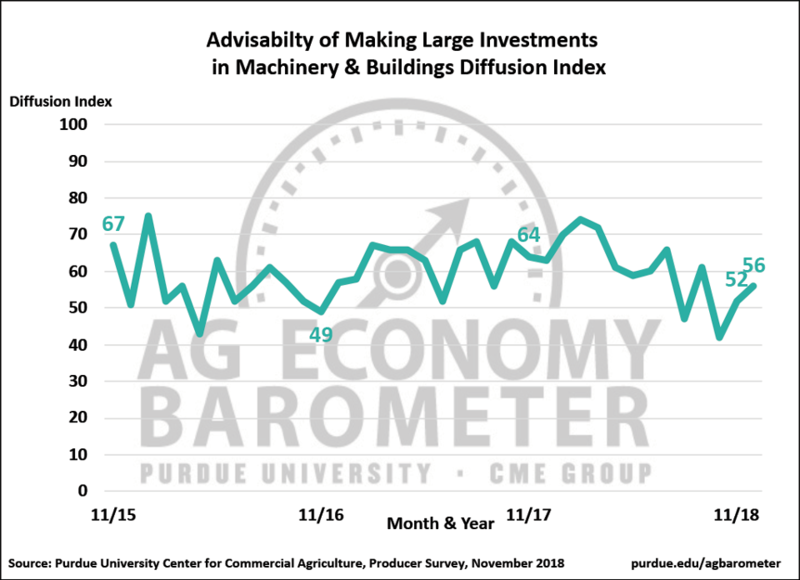 Advisability of Making Large Investments in Machinery & Buildings Diffusion Index, October 2015-November 2018. Other measures of producers’ long-run perspective include their expectations regarding farmland values, both one-year in the future and five-years in the future. This past summer, farmers became noticeably more pessimistic about farmland values than they were last winter. For example, the percentage of farmers expecting lower farmland values 12 months ahead increased from just 16 percent in February to 32 percent in September. But on the October and November surveys, farmers’ pessimism about farmland values subsided with only 22 percent of respondents from the November survey expecting to see lower farmland values in the upcoming year. Figure 4. 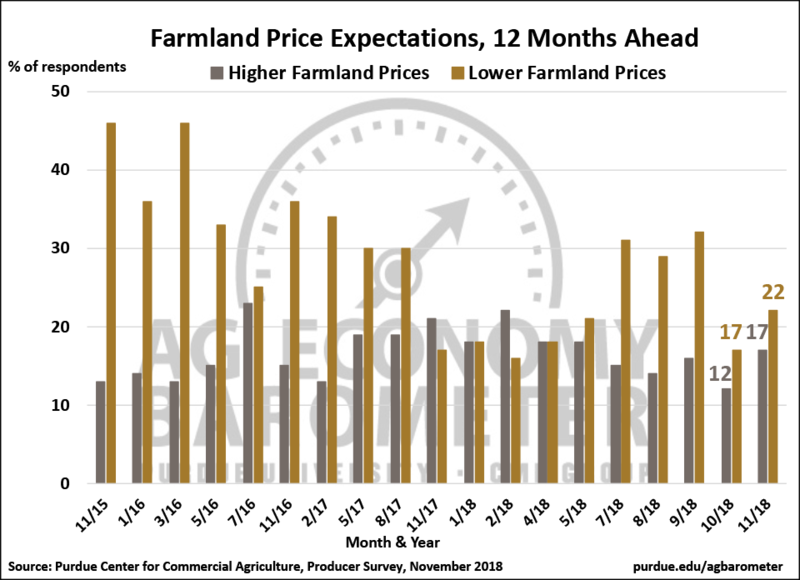 Producers farmland price expectations 12-months ahead, November 2015-November 2018. Evidence of farmers more favorable attitude towards farmland values in November was even more pronounced when we asked farmers for their longer-run (5-year) perspective. The percentage of farmers expecting farmland values to move higher over the next five years plummeted from 46 percent in September to 21 percent in October. But in November, this percentage rebounded back to 50 percent, which is near the upper end of the range of responses we’ve received to this question since we first posed it in May 2017. The shift in producers’ attitudes was largely the product of producers shifting from expecting higher farmland values to expecting values to remain the same (on the October survey) and then back to expecting higher farmland values from expecting values to remain the same (on the November survey). Additionally, in November the percentage of producers expecting lower farmland values in five years dropped to 9 percent compared to 23 percent in October, which was only the second time this percentage fell below 10 percent since we first posed this question. Despite the improvement in long-term optimism regarding large investments in machinery, buildings, and farmland, there remains an undercurrent of concern about the farm economy among producers. For example, the percentage of producers expecting profitability to improve has changed little in recent months, with only 13 percent of respondents in November indicating that they think farm profitability will improve in the next 12 months. Moreover, when we asked whether they expect farmers’ equity position to improve in the upcoming year, just 8 percent of respondents said they expect farmers equity position to improve and 44 percent said they expect to see farmers’ equity position diminish. Agriculture is a capital-intensive industry and, as result, changes in interest rates paid by farmers can impact profitability as well as the value of major farm assets, such as farmland. 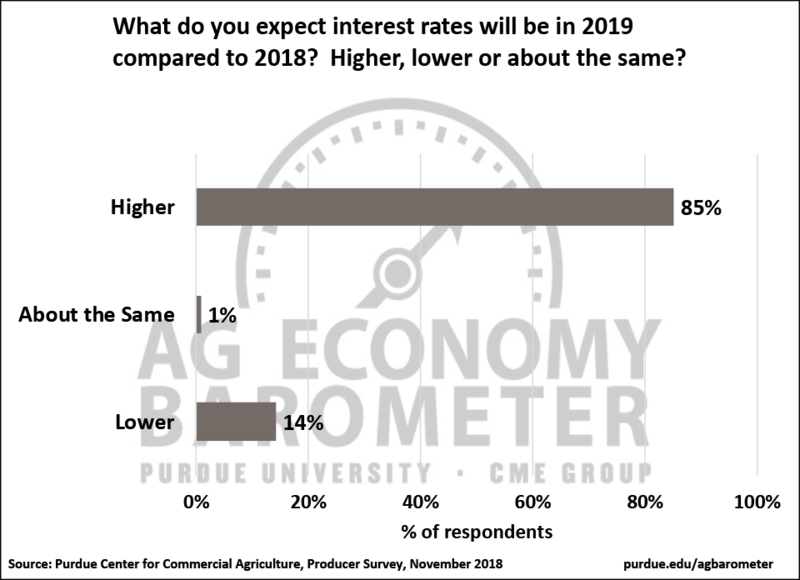 On the November survey, to learn more about farmers’ expectations regarding the future course of interest rates, we asked producers if they expect interest rates in 2019 to be higher, the same, or lower than in 2018. In a follow-up question, we asked producers to look further ahead and tell us if they expect rates in five years to be higher, the same, or lower than in 2018. In both cases producers told us they expect interest rates to rise. Looking ahead to next year, 85 percent of respondents expect to see higher rates than in 2018, while 14 percent expected to see lower rates. When queried regarding their longer-range perspective, 76 percent of respondents said they expect to see higher rates and just 4 percent expect to see lower rates. Interestingly, when asked to look ahead just one-year, only 1 percent of respondents said they expect rates to remain unchanged, but when asked to look ahead five-years, 20 percent of respondents said they expect no change in interest rates. Figure 5. Agricultural producers’ expectations for interest rates in 2019 vs. 2018, November 2018. Farmers are becoming more optimistic that current trade disputes will not hurt long-run growth prospects for U.S. ag exports. On six surveys, dating back to May 2017, we’ve asked producers if they expect agricultural exports to increase, decrease or remain the same over the next five years. In April of this year 46 percent of respondents said they expected ag exports to increase over the next five years. In July this percentage rose to 49 percent and in August it rose again to 54 percent. 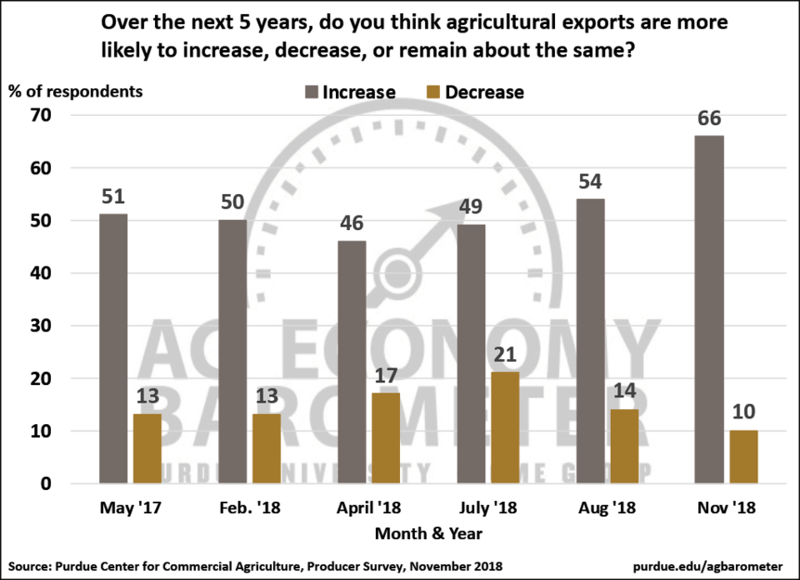 On the November survey, 66 percent of respondents said they expect U.S. ag exports to increase over the next five years. At the same time, the percentage of producers that expect ag exports to decrease fell from 21 percent in July to 14 percent in August and to 10 percent in November. Figure 6. Agricultural producers’ expectations for agricultural exports over the next 5 years, May 2017-November 2018. Adjustments farmers will make to their intended plantings for 2019 continue to be of widespread interest. On the November survey, for the second month in a row, we asked producers that grew soybeans in 2018 about their plans for 2019. In November, 3 out of 10 (30 percent) soybean growers said they planned to reduce their soybean acreage next spring, up from 19 percent that planned to reduce acreage when the same question was posed in October. Of the growers that plan to reduce their soybean acreage, nearly 7 out of 10 (69 percent) growers on the November survey said they plan to reduce their 2019 acreage by more than 10 percent compared to 2018, up slightly compared to responses received in October. Twenty-six percent of growers plan to reduce their 2019 soybean acreage by 5 to 10 percent compared to 2018, virtually unchanged from responses received on the October survey. As a follow-up question, we asked growers that plan to reduce their soybean acreage in 2019, what crop(s) they will grow on acreage previously devoted to soybeans. The number one choice was corn (66 percent of respondents) followed by “other” (20 percent of respondents) as the second choice. Winter wheat (8 percent of respondents) and spring wheat (6 percent of respondents) were the next two crops named as alternatives to planting soybeans. Responses in the “other” category probably included plans for a variety of crops, but could also simply reflect uncertainty on the part of soybean growers with respect to what they will plant on acreage that would have been devoted to soybean production. The 2014 Farm Bill expired on September 30, 2018 and new Farm Bill legislation was not a prominent point of discussion in most November 2018 Congressional races. Recently there’s been a push to encourage the lame duck Congress to pass new Farm Bill legislation before the end of the year. To learn whether the lack of a new Farm Bill was troubling agricultural producers, we asked farmers how concerned they are about the fact that a new Farm Bill has not been passed by Congress. Seventy-five percent of respondents said they were either somewhat or very concerned about the lack of a new Farm Bill with 33 percent of respondents indicating they were very concerned. Just 24 percent of survey respondents said they were not at all concerned about the lack of new Farm Bill legislation. Figure 7. Agricultural producers’ concerns about failure to pass new Farm Bill legislation, November 2018. The Ag Economy Barometer in November declined just over 1 percent compared to a month earlier, the result of a modest weakening in producers view of future economic conditions. 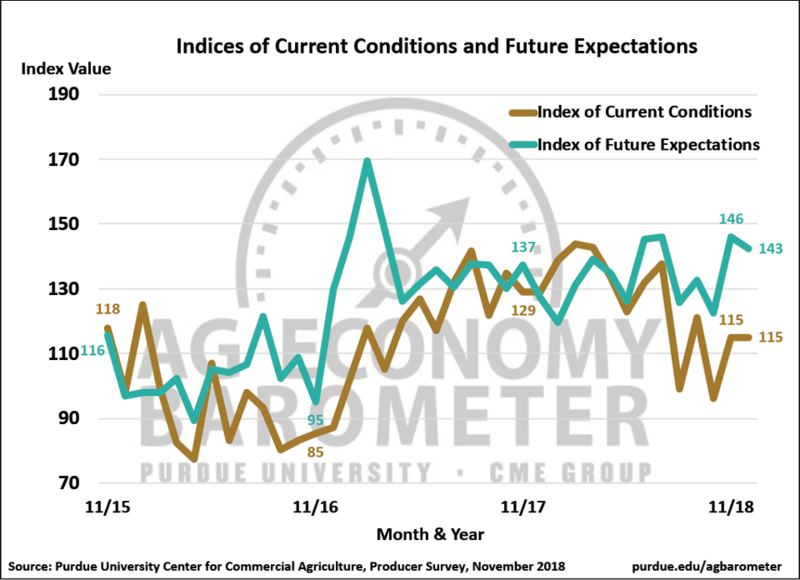 However, even with this month’s modest decline, the Future Expectations Index remains well above its September level and actually is close to its spring peak, indicating producers still have a relatively optimistic view of the future. Producers took a somewhat more favorable view of making large investments in their farming operation this month and also were more positive about future farmland values, especially when looking ahead five years. However, there remains an undercurrent of concern about the farm economy from producers as only 13 percent of producers expect farm profitability to increase in the upcoming year and only 8 percent expect farmers’ equity position to improve in the next 12 months. Looking ahead, farmers overwhelmingly expect to face higher interest rates in both the short-term (next 12 months) and longer term (next five years). Thirty percent of soybean growers said they plan to reduce soybean acreage in 2019, up from 19 percent that planned to reduce their acreage just one month earlier. Growers indicating they will reduce soybean acreage intend to make a significant cut as 69 percent of respondents said they would reduce their acreage by more than 10 percent. Finally, producers expressed concern about Congress’ failure to pass a new Farm Bill to replace the expired 2014 Farm Bill. 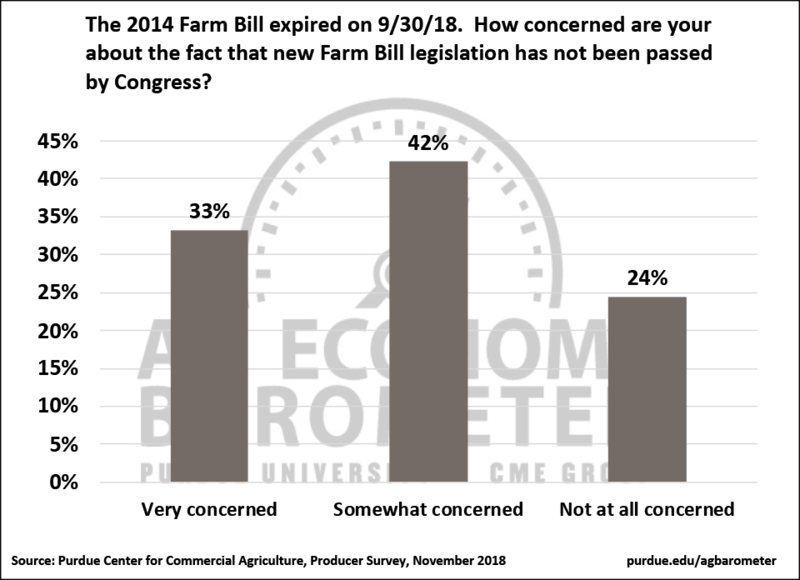 Three-fourths of farmers in our survey were either somewhat or very concerned about the lack of a new Farm Bill with 33 percent of them indicating they were very concerned.